There's no escaping the legend of Johny Bootlegger. There are hundreds of stories about why Johny is a legend. And each one of them is 100% true blue, all-American, according-to-Hoyle fact. It all started during the 1920s, after Prohibition went into effect, when everyone from fancy fellas and debutante dames to boardwalk grifters and dimestore floozies were looking for a titillating tonic to get their kicks from. For months, towns across the country were as dry as your mother-in-law’s Thanksgiving turkey. 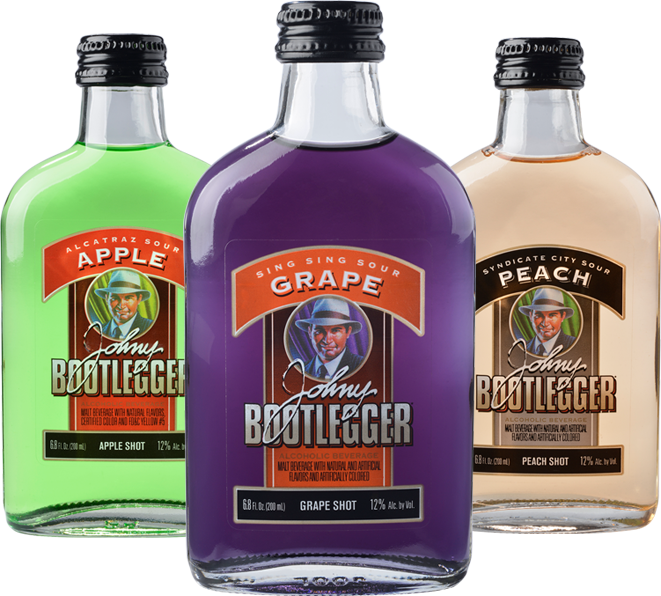 Until one glorious night, in the city that never sleeps, people from all walks of life soon discovered the libations that would liberate them from sobriety and satiate their desires — and it was all thanks to Johny Bootlegger. Johny was an ‘entrepreneur’ who was doing a stretch in Sing Sing for punching-out a police horse when he had the idea for creating private drinking clubs called ‘Speakeasies’ where people could go, socialize, meet dames, flirt with fellas and best of all, imbibe! Soon they were popping up everywhere. But they wouldn’t let you in unless someone vouched for you and you knew the secret knock — which Johny also invented. After being transferred to Alcatraz for bribing the guards at Sing Sing, he busted out using only a toenail clipper and a spool of twine and made his way back to East Coast to forge his alcohol-fueled empire. Here's what Johny's former associate, Teddy "Tight Lips", remembers about the legendary bootlegger. Johny Bootlegger is available wherever bottles of suds are sold. It's a capital choice when the occasion calls for libations! Contains 12% alcohol by volume, with seven flavors that are simply the bees' knees. Enjoy responsibly. OR ELSE.